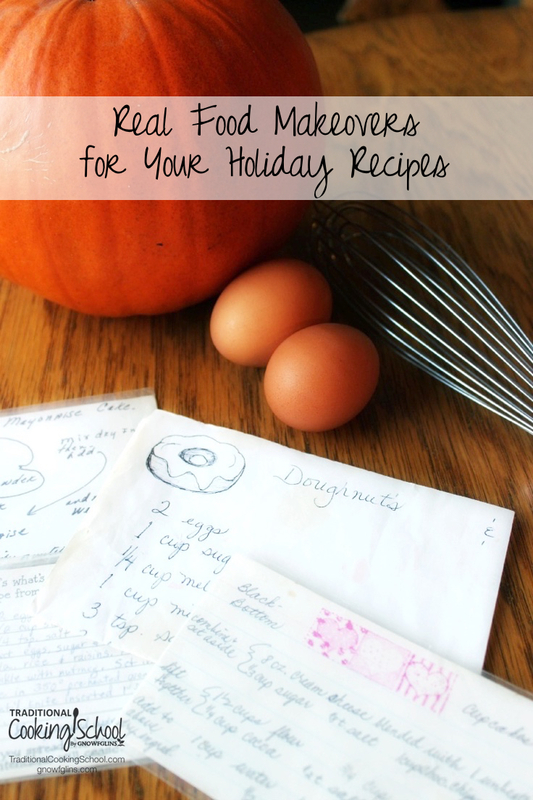 Got recipes you make just for the holidays? Me, too. It just isn't Thanksgiving or Christmas without my husband's grandma's pumpkin roll, my great-grandmother's flaky pie crust (whips up in 15 minutes or less), or my father-in-law's cornbread sausage stuffing. Food is definitely part of our holiday traditions. Certain dishes remind me of those who originally prepared them and times past. Some folks say a song takes them back. For me, it's recipes. However, now that I'm conscious of the ingredients going into our foods and using more traditional ingredients, many of our family recipes don't fit anymore. Anyone else have that problem? Thus, our favorite holiday recipes have had to undergo real food makeovers. Here are simple tips and substitutes to make your favorite holiday and family recipes a little bit more traditional, healthier, and even tastier! Green bean casserole is a favorite at Thanksgiving and Christmas dinner, but we need to say no to cans of condensed soup. They contain questionable GMO-related ingredients and artificial food coloring. Yuck! Lots of casseroles are based around these cans, but I've got a simple and frugal replacement recipe that takes less than 5 minutes and only costs $.50 with organic ingredients. It also includes dairy and gluten free options. Best of all, it tastes better! Here's my recipe for Processed Replacements: Make Your Own Cream Soup. Let's face it, a lot of our recipes contain a ton of sugar. And that's not good. Reduce the sugar. Most recipes can be cut be at least a 1/4 cup per 1 cup of sugar without anyone noticing the difference (and often, even more reduction goes without notice!). Stevia strength varies widely according to brand, so adjust to taste depending on what brand you choose (that's preferably only stevia without additional ingredients added). We like NuNaturals and Sweet Leaf brands of stevia. Wardee LOVES these stevia tabs that are perfectly sized for a cup of tea! What's a holiday without eggnog? Skip the store bought versions and make this beverage at home. Many recipes call for shortening, but regular shortening is based on genetically modified ingredients and is a highly processed trans fat that's implicated in heart disease. We don't allow it in our home. Thankfully, you can substitute any fat in a recipe with another — easily. In place of shortening, I use real organic grass-fed butter, lard, or coconut oil. For cookies, I prefer butter. Pie crusts and flat breads, like tortillas, make lard my new best friend (I render my own lard from our pigs, a plus for my dairy-free folks). Coconut oil is also great in pie crusts, but not so hot in cookies. Coconut oil has a lower melting point and I've found when I use it in cookies, they spread out really thin. In a recipe calling for shortening, I recommend using less coconut oil. For example, if a recipes calls for 1 cup of shortening, I'd use about 3/4 cup coconut oil. When baking, I'll often use applesauce or pumpkin puree in place of some of the fat or liquid in baked goods. This helps cut down on my costs as I can all of our applesauce and roast our pumpkins for puree instead of purchasing it. I love the added depth of flavor and moisture this brings. What ways have you made your family favorite holiday recipes healthier? We have either stopped making certain things, or just making them using whole ingredients. We’ve enjoyed real eggnog this year with eggs from our chickens. There are certain things we’ve given up, but a lot I’ve been able to modify. My kids love eggnog and I’m going to make them some this weekend from our own eggs, too. Isn’t it a good feeling to know where those eggs come from and how the chickens are treated? Great ideas! I’m using stevia a lot these days and feel SO much better. My family loves Poppy Seed bread at Christmas. The recipe calls for 1 cup of oil. I no longer use vegetable/corn or other processed oils in my kitchen. Would you suggest using the same coconut oil ratio you mentioned in regard to substitutions for shortening? Thanks! Coconut oil is great and what I use to replace oil in breads usually. I still use a bit less than the original recipe. If it calls for a cup of oil I’d use a cup of coconut oil minus a Tablespoon or two. I use unrefined so once it’s melted if I add in a cold egg or milk, it starts to harden back up. So make sure any eggs or milk are at least room temperature before mixing in with the melted coconut oil.